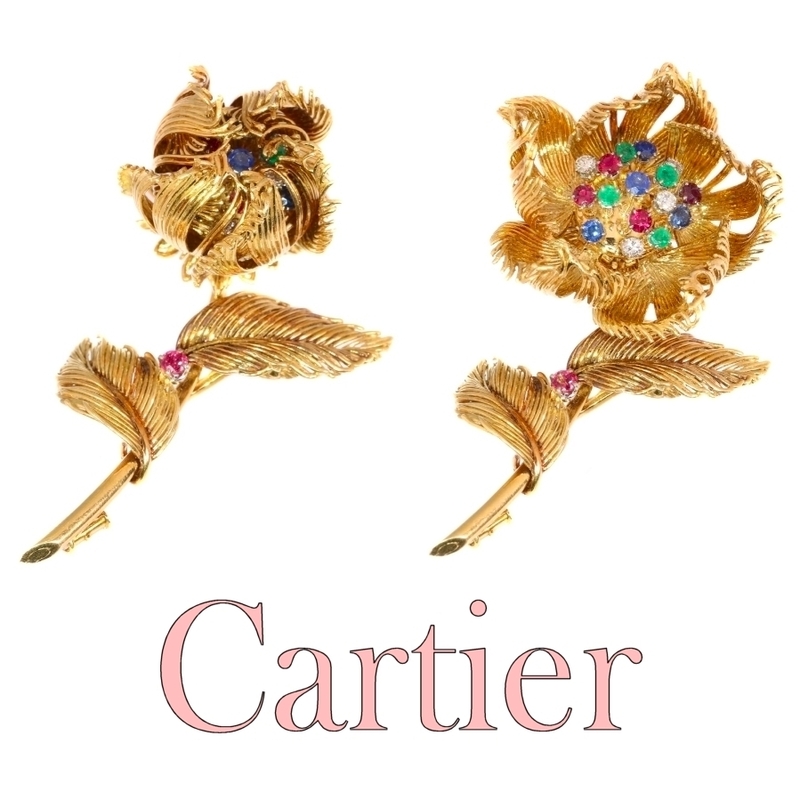 Cartier Vintage Fifties trembleuse brooch moveable flower that opens/closes: Description by Adin Antique Jewelry. While unfolding the five petals of gold gauze, a trembleuse heart of diamonds, sapphires, rubies and emeralds arises from this Fifties 18K yellow gold flower brooch signed by Cartier. With all its colour and gimmickry, this meticulously crafted statement piece can portray your every mood. Wear it with the flower wide open, and let your own magnificence radiate through the flickering gems as they jitter on top of their stems with every move you make. Or wear the flower as a closed bud and present a more mysterious and timid character full of promise with the potential of blossoming. Oh who are we kidding, this Cartier piece doesn't need our humble words. Let it speak for itself and you will see that this striking jewel simply fulfills everything one desires from any occasion. Technique: Tremblant or Trembleuse - Tremblant is French for "trembling". Referring to a jewel decorated with a flower or other motif that has at the top stiff projecting wires (embellished with gemstones) that tremble when the piece is subjected to any movement. Sometimes the projections are finely coiled silver springs, such as were used in the 18th century, but some examples were made with tubular stems enclosing a strip of steel spring. Diamond(s): Four brilliant cut diamonds with an estimated weight of ± 0.28ct. (colour and clarity: F/G, vs/si). Precious stones: Five rubies with an estimated weight of ± 0.28ct. Four sapphires with an estimated weight of ± 0.22ct. Four emeralds with an estimated weight of ± 0.16ct. Birthstones: Diamond is the birthstone (or month stone) for April, ruby for July, sapphire for September emerald for May.